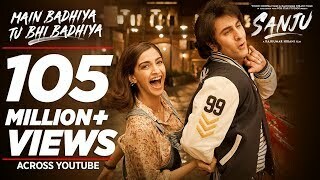 Main Badhiya Tu Bhi Badhiya Lyrics from Sanju: The first song from Sanju is here, where Ranbir Kapoor can be seen lip-syncing to female vocals. The song is a duet sung by two amazing singers – Sonu Nigam and Sunidhi Chauhan. It has music by Rohan Gokhale & Rohan Pradhan while these “Badhiya” lyrics are written by Puneet Sharma.